Cabbage (Brassica oleracea capitata) is a hardy, biennial plant, although grown as an annual crop. It is one of the most important of vegetables. It is a cool-weather crop, properly hardened plants being able to resist temperatures much below freezing. In the South it makes its growth mainly in the spring or fall. Like the other cole crops, cabbage is grown for its vegetative aboveground parts. The common cabbage, during the first year of its growth, produces a short stem which terminates in a large bud composed of thick, overlapping, smooth leaves, the whole structure being known as the "head." Different varieties are adaptable to a wide climatic range, and it is grown almost throughout the United States. In the North, especially, the early cabbage is usually started under protection and transplanted into the field. Plants of the Copenhagen Market variety were transplanted into the garden Apr. 10. The plants were placed 40 inches apart in rows which were 3 feet distant. Early Development.--The first examination was made June 4. The plants were about 5 inches tall and each usually possessed 20 to 25 leaves. The larger leaf blades, about 10 in number, averaged 4.5 inches both in length and width; the remainder only 2.5 inches in these dimensions. Although the plants were still small, the transpiring area, including both upper and lower leaf surfaces, was already only slightly less than 3 square feet. In all of the several plants examined a main root arose from the base of the enlarged underground part (the taproot having been destroyed in transplanting) and ran in a somewhat tortuous downward course. These roots reached maximum depths of 38 inches. Most of the laterals ran outward and downward, often at an angle of approximately 45 degrees or more from the perpendicular, to depths of 6 to 8 inches. At this depth many pursued a rather horizontal course in the second 6 inches of soil. They frequently reached a lateral spread of 3 feet on all sides of the plant. A few continued their obliquely downward course, ending 1.5 to 2.5 feet from the main vertical root at depths of 12 to 24 inches (Fig. 28.). Fig. 28.--Root system of Copenhagen Market cabbage 55 days after transplanting into the field. Few branches arose in the surface 2 to 3 inches of soil. The main lateral roots, usually 22 to 28 in number, were only fairly well clothed with branches. Sometimes an inch of root had only two to four branches but usually laterals 0.5 to 1.5 inches in length occurred at the rate of 4 to 7 per inch. These were unbranched. The upper portion of the main vertical root had a few rebranched laterals 3 to 9 inches long. Below 12 inches they seldom exceeded 3 inches in length and the deepest portion was quite unbranched. Since practically no roots occurred in the surface 6 inches of soil, except near the plant, cultivation at this time would have resulted in a minimum of root injury. Midsummer Growth.--Twenty days later, June 24, the cabbage was again examined. The plants were 1 foot high and had a total leaf spread of 26 inches. The transpiring area had increased to 19 square feet. The heads were 4 to 5 inches in diameter. During the 20-day period a remarkable development of the root system had occurred. The main vertical roots now reached depths of 4.5 to nearly 5 feet. The widely extending main lateral roots ran obliquely outward and downward and at a depth of 12 inches were 2.5 feet horizontally from the base of the plant. A maximum lateral spread of 41 inches was attained near the 3-foot level. These long roots reached depths of 3 feet or more. Within the soil volume thus delimited many roots arose from the enlarged underground part. They pursued such varied courses that the soil was quite filled with them and their branches to a depth of at least 3 feet (Fig. 29). Reference to Fig. 28 shows that many of the rather horizontal laterals of the earlier stage had grown downward and that new roots had occupied the soil directly beneath the plant. Fig. 29.--Cabbage excavated 20 days later than that shown in Fig. 28. Note the marked growth during the 3 weeks interval. Practically no roots arose from the upper part of the enlarged basal portion of the plant (which had a diameter of nearly 1 inch) but from its terminal part it gave rise to 30 to 38 roots. Most of these ranged from 3 to 6 millimeters in diameter, a few were smaller. These long, cord-like roots tapered gradually so that below 18 inches none were more than I millimeter in diameter and usually less. Branching, especially in the first foot of soil, was very profuse. From a large number of counts it was found that the number of branches per inch on the first foot of the laterals varied from 22 to 26 (maximum, 47). Although short and only fairly well rebranched, these rootlets were so very abundant that the soil was thoroughly filled with them. Frequently, they originated in groups. On the second foot of the laterals, the branches were longer (0.2 to 1.5, rarely 2.5 inches) and, although still very abundant, fewer (e.g., 5 to 7) per inch. But on some roots as many as 22 rootlets per inch occurred. All were more or less thread-like and usually 0.1 to 0.5 millimeter in diameter. They were poorly rebranched. From the widely spreading, almost horizontal roots, laterals, 3 to 12 inches in length, frequently arose. These extended in various directions, some almost directly upward. A few ended within 2 inches of the soil surface. Thus a volume of soil hitherto unoccupied was explored. But these surface-absorbing roots were relatively few and, as at the earlier examination, surface tillage would have resulted in little root damage. Branching in the second foot of soil was at the rate of three to nine laterals per inch. Although numerous rootlets were only a few millimeters long, others extended widely (Fig. 29). Many were fairly well rebranched. The younger portions of the roots, which occupied the third foot of soil, were furnished with only short branches. On the deeper, main vertical roots, branches were only 0.1 to 2 inches long below the 2-foot level. As shown in the drawing, their occurrence was somewhat irregular, a distribution usually explainable upon the basis of soil texture. The roots were slightly yellowish in color and hence the smaller ones were difficult to follow in the clayey subsoil. When they were broken, large drops of sap soon collected on the ends. This was more noticeable in the cabbage than in most other plants. The cabbage taste was characteristic of all the roots, even the still rapidly growing root ends. Although the rows were 40 inches apart, no soil space was unoccupied. In fact at this time considerable overlapping of the territory occupied by the plants in the adjacent rows and especially by plants in the same row occurred. Mature Plants.--A final examination was made Aug. 4. The plants were over 1 foot tall, had a spread of more than 2 feet, and possessed firm, well-matured heads. In addition to the buds or heads about 22 large green leaves per plant were present. More than a dozen dead leaves clothed the base of the stem. Thus there was presented a very large transpiring area, approximately 34 square feet, to the hot, dry, midsummer air (Fig. 30). Fig. 30.--A fully grown cabbage plant showing the large leaf surface which was 34 square feet. To provide sufficient water and nutrients for the tops, the root system, already so well distributed in June, had greatly extended its range and fully ramified the soil. The soil was drier in the cabbage plat than in the adjacent, unplanted area. This was very noticeable even to a depth of 5 feet. Compared to the water content in the beet plats, the surface foot was drier (often 3 to 5 per cent) at all times. At greater depths, however, there was usually less water available in the plats of beets. 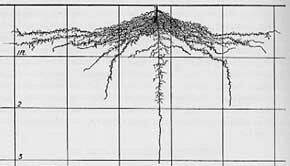 A few of the main vertical roots had greatly increased in length, a maximum depth of 7.8 feet being attained. The last 8 to 12 inches of roots were quite unbranched. In fact, below 3 feet the branches were short, ranging between 0.2 and 1 inch in length. Branches 2 to 3 inches long were occasionally found. They occurred at the rate of five to nine per inch and were usually simple. These deeper roots were quite sinuous in their course. In the harder, calcareous soil of the fourth foot, the zigzag course was most pronounced. The maximum lateral spread was scarcely greater than at the previous examination, about 3.5 feet on all sides of the plant. But within the soil volume thus delimited a wonderful root development had occurred. The abundant main roots, which ran at various oblique angles (Fig. 29) and had reached a working level of 32 inches on June 24, now attained 62 inches. Thus the volume of soil ramified by the roots was nearly doubled. The depletion of the soil moisture at this depth is clearly apparent. The roots were very abundant to the 62-inch level, being found in almost every cubic inch of soil. They were somewhat fewer just above this level and were scarce below 62 inches. Branching in this new soil volume was profuse but scarcely so extensive as in the first 2.5 feet. Some differences in branching habit were clearly related to soil structure. The very hard, dry soil of the second foot, particularly, was not so well filled with rootlets. Here, too, the roots were much more curved and crooked, undoubtedly due to difficulty in penetrating the soil. On the best-branched portions of the root system laterals occurred at the rate of 15 to 20 per inch. They were rebranched at the rate of 10 to 12 per inch, these being branches of the fourth order. A fair conception of the remarkable absorbing system of cabbage may be gained by a study of Fig. 29. It should be kept in mind that in this late stage of development branching is much more profuse than here pictured, and that a somewhat similar, although less profuse, network of roots extended to a depth of 5 feet. This filled most of the space here delimited by the widely spreading laterals. In fact the soil had been so depleted of its moisture--or perhaps this was due partly to the age of the plants--that some of the rootlets were beginning to wither and die. Summary.--Copenhagen Market cabbage is characterized by a very extensive, fibrous, finely branched root system. When the taproot is injured in transplanting, one of the long laterals usually assumes the position of a taproot. It is usually no more prominent, however, than many of the other major laterals that arise in great numbers from the base of the enlarged underground part. At first nearly the entire root system consists of widely spreading branches in the surface foot of soil. Later these run obliquely downward and with other more obliquely and vertically descending laterals thoroughly occupy the deeper soil. A maximum lateral spread of 3.5 feet is attained about the time the heads are two-thirds grown, but the depth of the root system in the soil thus delimited is thereafter doubled. Mature plants have a working level of 5 feet, to which depth the soil is well ramified with a profuse network of absorbing rootlets. Thus a single plant draws upon more than 200 cubic feet of soil for water and nutrients. The Early Flat Dutch variety was studied at Norman, Okla. The plants were spaced 2.5 feet apart in rows 3.5 feet distant. Cultivation was very shallow so as not to injure the roots. Mature Root System.--The root system of small but mature plants was quite similar in character to that just described but in extent it more nearly approached that of the June 24 examination. The strong, cord-like laterals were just as abundant and quite as well branched with delicate laterals. A maximum spread of 33 inches and a maximum depth of 46 inches were attained. Seed Cabbage.--Plants grown the preceding summer lost their leaves during late summer, but these were replaced in the fall by new leaves, about 3 inches long, developed from the stem. The tops made practically no growth until spring and no new roots had developed. On Mar. 1 the plants were uprooted and then reset in a manner similar to that practiced in raising cabbage for seed. Conditions were favorable for root establishment, and by the end of the month a dense network of fine roots had developed from the old root-stem axis and from the broken laterals left on the plants in resetting. Typical plants had 18 to 35 strong laterals about 1 millimeter in diameter and 11 to 14 inches long. In addition 200 to 300 roots about 0.5 millimeter thick and 5 to 6 inches long had developed. These roots either turned downward or grew in a somewhat horizontal direction through the moist, mellow soil. All of the new roots were very fine and the older portions well branched. Laterals reaching 4 inches in length occurred on the older parts at the rate of 6 to 12 per inch. The root system was extremely fine and fragile, making excavation very difficult. Moreover, branches were so numerous that it was impossible to show the entire root system in a plane. Hence, only a part of it was drawn in Fig. 31. 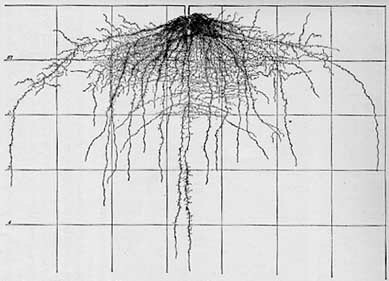 This shows the dearth of roots in the 3 inches of surface soil, except directly beneath the plant; also the wide lateral spreading of the horizontal roots in the surface foot (the maximum was 36 inches); a spread of 12 to 18 inches in the second foot; and the unbranched root ends in the deeper soil. The greatest depth was 33 inches. The long, rebranched laterals intermixed with the shorter, mostly unbranched rootlets were characteristic. The latter were mostly 0.5 to 3 inches long and usually pursued a course somewhat at right angles to the roots from which they originated. Fig. 31.--A portion of the root system of a cabbage plant reset the second year for the production of seed. The old root system has been replaced by a new one of a quite different type. Summarizing, Early Flat Dutch cabbage has a root system similar in habit but less extensive than that of the Copenhagen Market. Plants reset for seed develop a very dense, fibrous root system which occupies a conical soil volume nearly 5 feet in diameter and 2.5 feet deep. 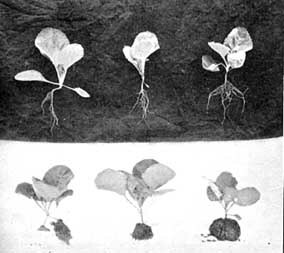 Development of Roots and Tops as Affected by Cultivation.--During 1926 experiments were conducted to determine the effects of deep and shallow cultivation upon root development of cabbage and its relation to the water and nitrate content of the soil. The plants (Copenhagen Market variety), when transplanted into the field May 3, were placed in two plats separated by an uncropped area 10 feet wide. Each plat consisted of 5 rows 40 feet long and 3 feet apart and the plants were also 3 feet distant in the rows. The field was an almost level lowland and the soil a moderately rich silt loam. Hence, the plants made a good growth notwithstanding a dry summer. In fact April, May, June, and July each had a precipitation below the normal, the total deficiency amounting to 4.4 inches. During these months (Apr. 1 to Aug. 5) only 16 showers in excess of 0.15 inch occurred. The year was also characterized by a late, cold spring. One plat was hoed 3.5 inches deep at five different periods, viz., May 15 and 31, June 14 and 25, and, finally, July 11. On the same dates the other plat and the uncropped area were thoroughly scraped to a depth of ½ inch. An examination of the roots in the two plats on June 19 revealed no differences in the size or direction pursued by the laterals in the surface foot of soil. The root systems were found to agree in all respects with those excavated the preceding year. Most of the roots occurred below the maximum depth of hoeing but some horizontal roots had been severed. In every case these were much more branched than similar, shallow, horizontal roots in the scraped plat. Moreover, from near the cut end a large number of long, rebranched laterals had extended downward (Fig. 32). Thus the chief direct effect of deep cultivation on the root system was to promote branching of the injured roots. Fig. 32.--Representative surface roots of cabbage under two types of cultivation. The upper root shows normal development in the surface soil layer. The lower one has been cut by deep cultivation. This resulted in a great increase in branching. Scale in inches. A later examination, July 28, revealed that the roots in the scraped plat extended to within ½ inch or less of the soil surface. Under the leaves that covered the ground for a distance of 1 foot on all sides of the plant the surface soil was moist and the roots came to within 2 millimeters of the surface. 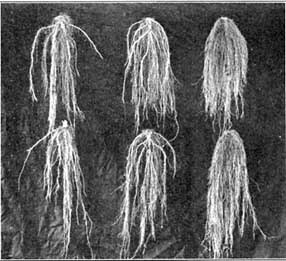 In the deeply hoed plats few or no roots were found in the surface 3.5 inches of soil except near the base of the plant where branches occurred from the cut root ends. The soil was fairly moist. The center of the uncropped area was, in general, free from roots, although a few were traced two-thirds of the distance across this 10-foot strip. A study was made of the moisture content of the soil of the two plats and that of the uncropped but scraped, intervening area. Samples were taken in duplicate at the several depths at each determination. These data are given in Table 13. An examination of this table reveals the following facts: In both of the plats sufficient water at all times was available to promote good growth. After the roots became widely spread between the rows, where the samples were taken, the water content in the deeply hoed plat became gradually less than that in the middle of the uncropped area. This decrease in soil moisture was in general progressive throughout the season and as the roots extended deeper it became marked even at depths below 2 feet. A decrease of 2 to 4 per cent was common in the surface foot, although it was sometimes more than twice these amounts. Moisture content of the scraped and uncropped area was also uniformly much greater at all depths than that in the scraped and cropped plat. Differences of 3 to 5 per cent were common in the surface soil and 2 to 5 per cent below the first foot. These differences indicate the large amounts of water removed from the soil and subsoil by a crop of cabbage. A comparison of the deeply hoed and scraped plats shows that water content in the former was, with one exception, constantly higher at all depths to 2 feet. Differences of 3 to 4 per cent in favor of the deeply cultivated plat were frequent and they were sometimes more marked. At greater depths similar marked differences occurred later in the season when absorption in the deeper soil was vigorous. The greater water content in the surface soil was due in part undoubtedly to the soil mulch afforded by deep hoeing during this year of drought and partly to the absence of roots in this soil layer. The greater exhaustion of the water in the deeper soil in the scraped plats may, have been due to a better development of the deeper portion of the root system. During the latter part of July and in August, it was clearly evident that the deeply hoed cabbage was not making the same vigorous growth as that in the scraped plat. 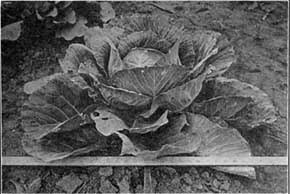 The cabbage in the scraped plats had the advantage of utilizing the nutrients in the surface 3 or 4 inches of soil, which was the richest part of the substratum. Determinations of nitric nitrogen were made on the several dates shown in Table 14. At every determination the amount was greatest in the uncropped soil; in fact, it was often twice the amount found in the cropped plats. After July 3, when the root systems were well developed, the differences were very marked. No consistent differences were found between the nitrate content of the soil in the deeply cultivated and scraped plats. These results are in accord with those obtained at Ithaca, N. Y., where soil samples were taken at intervals of approximately two weeks during the growing season to a depth of 18 inches. They were obtained from several plats of cabbage, beets, carrots, onions, tomatoes, and celery and from fallow soil. "With the cropped areas the differences in nitrates between the cultivated and the scraped plats were not significant except with the trained tomatoes, where the cultivated soil averaged higher than the scraped soil." 159a As regards the cultivated and scraped fallow plats a slight increase in nitrate nitrogen was found in the former. Further studies on cabbage (Cophenhagen Market variety) at the same station are of interest. Twenty-five days after the plants had been transplanted into the field, they were stocky, 4 inches high, and had a total spread of 6 inches. The roots were 10 inches deep and the soil within a radius of 8 inches was well filled with fibrous roots, many of which were within an inch of the soil surface. Twenty days later, on half-grown plants the soil was well filled with fine branching roots to 15 inches depth, some extending to the 22-inch level. Lateral roots had reached the centers between the 3-foot rows and the surface soil was well filled with fine roots to a distance of 12 inches from the plant. The roots grew rapidly and when the plants were fully grown had reached a depth of 3 feet. The soil was well filled with fine roots to a depth of 30 inches. Many roots were traced to adjoining rows. The main laterals, which were of nearly the same size throughout, grew almost horizontally. The roots were extremely well branched and so filled the surface soil that cultivation could not be given without destroying large numbers of them. A study of the root system of a mature Very Early Etampes variety of cabbage at Geneva, N. Y., revealed that the fibrous roots lie chiefly in the upper layers of the soil, some approaching very near the surface although they also penetrate to a considerable depth. In this small, early variety, a lateral spread of about 18 inches and a depth of penetration of 20 inches were attained. 43 Since the plant was washed from the soil it is quite probable that the entire root system was not recovered. Relation of Root System to Cultural Practice.--The very extensive and finely branched root system of cabbage, together with the extensive development of the tops, helps to explain why it is "hard on the land." Compared with beets, for example, under the same type of cultivation, Table 2 shows that cabbage much more thoroughly exhausts the water supply in the surface foot of soil, the place where its roots are most abundant. From May 29 to Aug. 13 an excess-moisture supply of 2 to 9 per cent in favor of the beets was ascertained. This intensive absorption by the shallower portion of the root system helps to make clear why on a good loam soil frequent shallow irrigations 8 to 10 days apart, particularly after the cabbage begins to head, result in larger yields than heavier irrigations at longer intervals. 33 Indeed, it is very dependent upon a proper supply of water and suffers more from a lack of it than most garden crops. The roots also need good aeration; in wet soils the plants turn yellow and cease growing. The roots must also supply the plant with a large amount of nutrients, especially nitrogen and potassium, to develop the large, succulent leaves. The time of application of the fertilizer influences both the time of maturity and the total crop yield. In fact, cabbage soil can hardly be made too rich if the food materials are in a well-balanced form. Thus it is easily understood why, although early varieties do well on light soils, late-maturing crops, to give high yields, must be grown on clay-loam or silt-loam soils, preferably those with considerable humus, where both water and nutrients are constantly abundant. This results in a uniform, continuous growth. If the heads, because of lack of moisture, cease growing when nearly mature and again start growth as a result of rains or irrigation, they are very likely to crack. This bursting is due to the absorption of excessive moisture by the roots. It may be prevented by pulling on the stem sufficiently to break a part of the roots or by deep cultivation. Cultivation.--The superficial position of many of the very long, horizontal roots of the cabbage and its habit of thoroughly occupying even the surface 1 or 2 inches of soil show clearly why cultivation should be shalow. Root growth is better and cultivation easier when the soil has been deeply plowed and well prepared. Experience has shown that cabbage requires considerable room to develop properly. Consequently, plants are spaced, depending upon the variety, 1 to 2 feet apart in rows 2 to 3.5 feet distant. But after only a few weeks of growth the roots overlap between the rows and the soil is thoroughly ramified. There is no place for competing weeds and sufficient cultivation should be given to keep them out and perhaps to maintain a soil mulch until the roots rather thoroughly occupy the soil. The plants respond to good cultivation by vigorous growth of roots and tops. They will not tolerate neglect like many other vegetable crops. Later cultivation is sure to cut many of the roots and thus decrease the absorbing area. As already indicated, this results in decreased yields. Like the soil in a field of sweet corn, it is so thoroughly occupied by roots that little water is lost by direct evaporation. In fact, the effect of a soil mulch in conserving moisture appears to have been greatly exaggerated in popular literature on gardening. Transplanting consists in lifting the plant from the medium in which its roots are established and in replanting in a different location. It is a violent operation because the younger roots with their root hairs are, as a rule, sacrificed in the process of lifting. This is just the part of the root system most active in absorption. Taking up plants for transplanting results not only in breaking many of the roots but also especially in injury to the taproot. As a consequence many new roots are formed. These do not grow so long as the original ones. They form a more compact root mass about the base of the plant. Hence, the root system is less disturbed when the plant is finally transplanted into the field. Thus, although the root system of transplanted plants may be less extensive than that of undisturbed ones, upon removal to the field the transplanted plant carries more roots with it and consequently more readily reestablishes itself. Recent investigations throw much light upon the results obtained by different methods of transplanting vegetable crops. * Like many old-world practices brought to America, such as pruning and suckering, excessive cultivation, and too heavy fertilizing, methods of transplanting have heretofore been accepted without adequate investigation. Because of the excellent tilth and fertility of virgin soils the growing of vegetable crops has been generally prosperous in spite of these practices some of which, however, have been gradually eliminated either as being unnecessary or injurious. * Many of the data on transplanting have been abstracted from the excellent paper: Loomis, W. E., "Studies in the Transplanting of Vegetable Plants." One of the chief arguments nearly always advanced in favor of transplanting is that the branching of the root system is increased as a result of the root pruning. That the roots of transplanted plants are more branched than those not transplanted is shown in Fig. 33. The tendency of transplanted cabbage to retain balls of earth with their roots as well as the development of the root system itself are shown in Fig. 34. Thus it is possible to transfer a good ball of earth with twice transplanted cabbages, for example, while the roots of plants not transplanted are practically bare. Although transplanting was formerly considered beneficial in itself, it is gradually coming to be recognized as an expedient not directly promoting the development of the plant. Although strongly recommended by the older gardeners and many of the earlier writers on the subject of vegetable growing, there seems at present to be considerable doubt in the minds of growers concerning the advisability of giving more transplantings than are required in the most economical production of the crop. That is, the tendency is away from transplanting as a cultural practice toward transplanting as a matter of economics. Certain crops, as early lettuce and cabbage or tomatoes, are transplanted in order to grow them out of the normal season for a given locality. Tomatoes, sweet potatoes, and similar vegetables may also be grown in higher latitudes if the plants are started with artificial heat. The use of artificial protection usually requires transplanting, because it is most convenient to have the plants concentrated into a small area while the protection is being given. The same is true when special care in cultivation, watering, protection from insects, and so forth are required by the seedling plants. A third factor, which accounts for most of the transplanting in greenhouses and some of that done in intensive cultivation, is the saving of space and of expensive seeds. For these reasons transplanting will be practiced as long as profitable crops can be produced by the method. On the other hand, it is an expensive operation and not to be performed unnecessarily. Experiments have shown that the general effect of transplanting is to retard development. The growth of young plants may be arrested without serious injury but the effect of equivalent checking increases with the maturity of the plant. The degree of retardation varies with the kind of plant, its age, and the conditions of transplanting. Cabbage is one of a group of plants, in which are also included tomatoes, lettuce, and beets, that easily survives transplanting. Peppers, onions, celery, and carrots are transplanted with more difficulty and a third group consisting of such species as corn, beans, melons, and cucumbers are very difficult to transplant successfully except at a very early age. In fact with advancing maturity injury from transplanting increases in all cases. A single transplanting at a later stage of development may do more injury than two or three earlier transplantings. Hence, transplanting at the proper time is one of the most important features in growing vegetable crops. There is a rapid decline in the rate of root replacement with increasing age. The immediate effect of transplanting is to slow down or stop the growth of the plant for a period which seems to vary directly with the amount and duration of the reduction of the water supply. The rate of new root formation is the most important consideration in the reestablishment of transplanted vegetable crops. When a large proportion of the root system is retained and adequate moisture supplied, there may be very little harmful effect from transplanting. Recovery from transplanting is affected by a large number of environmental and internal conditions. Among these are the amount of suberization of the older roots, the proportion of the root system normally retained in transplanting, the rate of new root formation, and adaptation of the tops (by hardening, etc.) to prevent water loss or increase resistance to death by sudden wilting. In addition to these are the environmental factors of soil moisture, humidity, temperature, wind, etc. But all appear to be based in their final effect upon a change in water supply of the plant. Experiments have shown that the most important factor involved in resistance to transplanting or recovery is the root. Cabbage and other easily transplanted plants, as compared with corn, melons, etc., retain a relatively larger proportion of their root system when transplanted (a fact due in part to their network of fine branches); the retained roots are much less suberized and consequently more efficient absorbers; and the rate of new root formation is much greater. The practice of growing plants in pots, small boxes, cans, or plant bands is advantageous inasmuch as the root system is little disturbed in setting the plants into the field, since practically all of the roots remain in the ball or block of soil. Likewise, they may be shifted from one receptacle to another of larger size with little or no injury to the roots. In transplanting cabbage the leaf area is often considerably reduced so that transpiration will not be too great. 100 This is accomplished by gathering the leaves of the plants together and shearing the upper portion, care being taken not to injure the buds. The transplanting of smaller plants, however, would seem more advisable. 33 Although the ratio of roots to tops may fluctuate widely for a short period after transplanting, it tends to come to an equilibrium which is dependent upon the balance between growth and food supply in the plant, i.e., the supply of water and soil nutrients to the tops and elaborated food to the roots. Further studies of these subjects are needed. 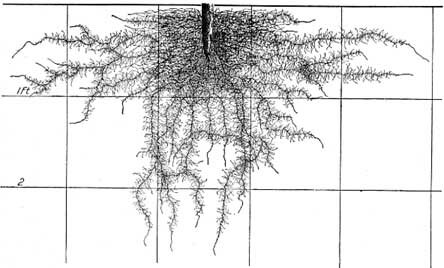 Relation of Roots to Competition and Disease.--Competition among cabbage plants must be entirely below ground and in connection with the root systems, for the widely spaced plants will not shade each other considerably. Hence, attention in spacing should be fixed upon root habit in the various types of soil in connection with the size of head desired and methods of cultivation. Investigations have shown that disease resistance and predisposition to disease may largely depend upon environmental conditions under which the plant is developing. 72 By selecting plants whose roots are resistant to the fungus attack or ensuing injury, cabbage yellows has been brought under control. 74 These facts suggest another reason for a thorough understanding of not only the morphological relation but also the structural changes and chemical composition of roots.